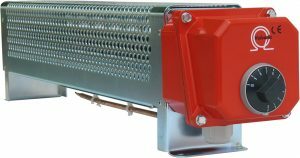 Vulcanic industrial radiators are designed to heat industrial premises, technical enclosures and containers up to 50°C. Available from 500W to 4500W in 230V single, 400V single and 400V 3-phase. Heating by natural convection. Horizontal floor-mounted assembly or on consoles for wall mounting. Vulcanic industrial radiators are constructed of 1 to 3 finned heating elements protected by a perforated steel or stainless steel casing for damp or corrosive atmospheres. These radiators can be equipped with a thermostatic control device (0 to 50°C) with external setting button. An IP42 or IP55 aluminium cover protects the connections from the heaters for connection to the power supply and control device. 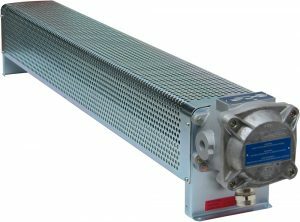 Vulcanic industrial radiators are designed and manufactured either as part of our standard range or as a customised solution (special applications: marine, nuclear, etc.) in our factory in St Florentin. 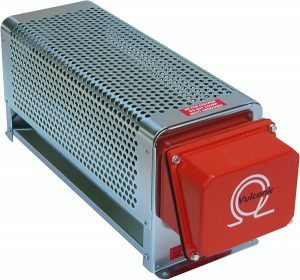 These appliances are also ATEX-certified according to Directive 2014/34/EU, for installation in an explosive atmosphere (risk areas 1 and 2) and for temperature class T1 to T4, under protection mode “d” or “de”.